Syrian military have reportedly brought down a “hostile” US surveillance drone flying in Syrian airspace, apparently without Damascus’s consent. A US official confirmed that the military “lost contact” with one of their UAVs over Latakia province. “Syrian air defenses brought down a hostile US surveillance plane in northern Latakia,” the Syrian state news agency SANA initially on Tuesday, providing no further details. Syrian authorities have meanwhile begun an investigation to find out who owns the reconnaissance plane, reported Kuwait’s KUNA news agency. State television also showed footage of what seemed to be the wreckage, including electronic parts of the suspected aircraft. The origin of the surveillance drone, originally pronounced to be American, came under doubt after a number of Arabic blogs showed pictures of the wreckage. In one of the takes, the pictures show what looks like a battery unit, with clearly visible sign, ‘Made in EU’. However, a US official confirmed to Reuters on condition of anonymity that the United States lost contact with an “unarmed drone aircraft” over Syria. Another source said the incident was being investigated. "At this time, we have no information to corroborate press reports that the aircraft was shot down," the source said. "We are looking into the incident and will provide more details when available." Neither the US State Department nor CENTCOM have yet officially commented on the incident. “US military forces continued to attack ISIL (Islamic State / ISIS) terrorists in Syria, using fighter, attack, bomber and remotely piloted aircraft to conduct seven airstrikes,” CENTCOM said of its continued allied mission over Syria that began in September. The Central Command did not mention where drones were deployed to carry out strikes. It remains puzzling how US aircraft ended up in the coastal province of Latakia. According to the Syrian Observatory for Human Rights, the Islamic State does not operate in the province. The province is home to the town of Qardaha, ancestral town of President Bashar Al-Assad and is considered a stronghold of the Alawite minority in Syria. Since the beginning of the Syrian conflict, parts of northeastern Syria have been captured by the Islamic State. The group was reinforced by dozens of opposition rebel factions, some of which had previously been supported by Western governments. Nevertheless, Washington continues arming and training what they call “moderate” Syrian militants who fight against Assad’s government. Last August, President Obama ordered “limited strikes” against ISIS in order to protect American personnel in Iraq. One month later, Obama announced he was broadening the military campaign to “destroy” the Islamic State and prevent its advance into neighboring territories, including Syria. 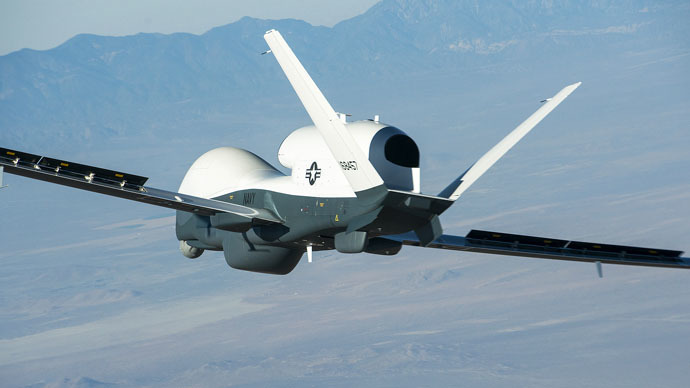 Since the start of the bombing campaign, US drones have undertaken both surveillance and strike missions in Iraq and Syria as part of Operation Inherent Resolve. If confirmed, the incident would become the first downing of a US aircraft since the beginning of the campaign. Besides US deployment of drones to Syria, the UK in October admitted to using Reaper and Rivet Joint aircraft for surveillance missions over the country. Overall, the US-led alliance of nations which conducted airstrikes in the region also includes Bahrain, Jordan, Saudi Arabia, and the United Arab Emirates. Syria did not formally consent to the strikes on its territory, claiming that operations without Damascus’s coordination is a violation of sovereignty. However the US authorities, who have long been demanding Assad’s unconditional resignation, insist that his power is illegitimate, thus claiming there was no need for military coordination with Damascus.